I had the good fortune to be in the store yesterday while Treadlette Lynda was assembling quilt kits for this weekend's Shop Hop. I just had a chance to snap a pic before she bundled them up into neatly folded little parcels of loveliness. 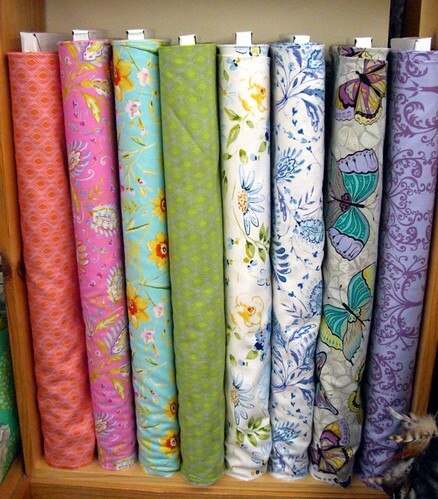 You can see Treadle's display quilt, made in these fabrics, hanging in the store during the Hop, and the kits will be available for sale (while they last!). Check out this sweet new group of prints in linen/cotton blends. 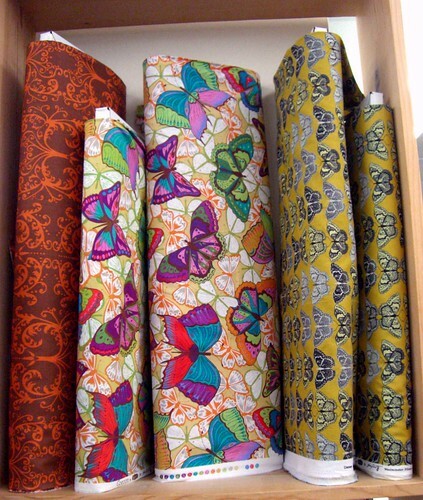 These butterfly fabrics are available both as a linen blend and as a cotton broadcloth. We also have the multicolored butterfly print on a lovely lightweight cotton lawn. I love a nice print, but the light weight and crisp hand of so many printed fabrics designed for quilting is not always right for garments, so it's nice to see a beautiful print in a more versatile weight. The heavier weight of the linen fabrics makes them ideal for more structured garments, such as simple dresses or straight skirts. They'd also be great for handbags, cushions, or any project where you'd like a little more body. 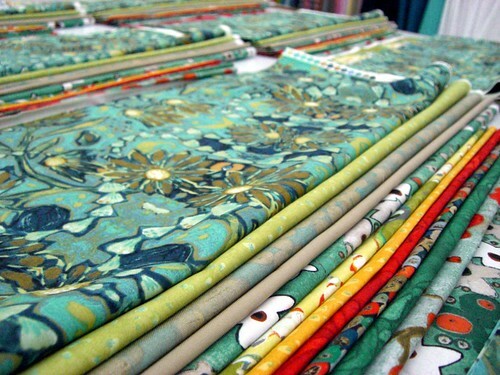 We have many, many more prints in linen/cotton blends in the store, ready for spring! Check out this fabulous quilt made by our own Rebecca at Treadle! 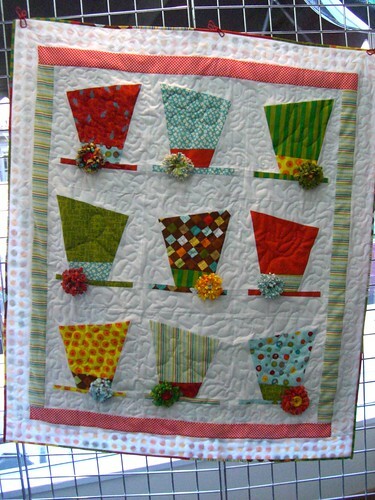 You can see this quilt, and find the Top Hat block pattern, in our store. 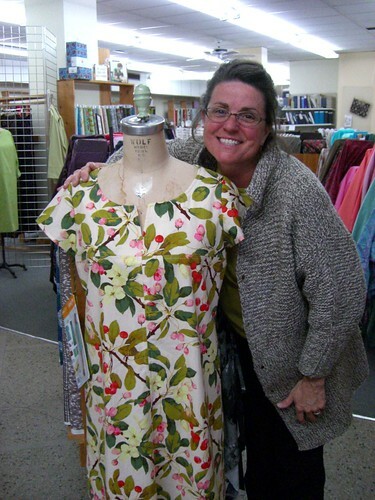 The 2012 Twin Cities Shop Hop is coming soon! May 3-5, stop by Treadle and the other 8 participating shops to see the lovely sample quilts and pick up a free quilt block pattern. Get a card stamped at each shop to enter a prize drawing! Find out more here, including the list of participating shops! Yesterday in the store we opened what is probably the biggest shipment of books I have ever seen at Treadle! There are at least 15 new titles covering tons of subjects, from basic how-to and reference guides to project books beautifully illustrated with lush, inspiring photos. Plus we got a few old favorites back in stock. 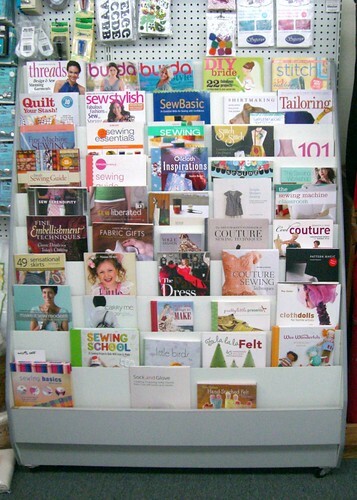 You'll find books on everything from couture sewing to quilting, from baby and kid clothes to abstract fiber art on our shelves. Stay tuned for a more in-depth exploration of some of the new titles! 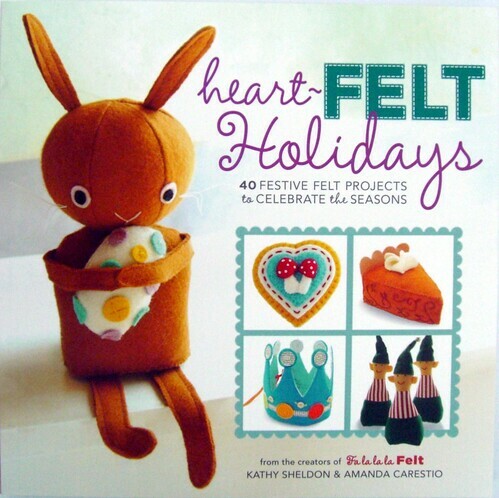 From the creators of last winter's amazing book Fa La La La Felt now comes Heart-FELT Holidays. An entire year of holidays is represented with projects ranging from pillows and ornaments to costumes and toys, all made of felt. There are April Showers umbrella appliqués for spring, faux mustaches for Father’s Day, an autumnal leaf table runner, Easter eggs, Hanukkah mice, Chinese New Year lanterns, and so much more. 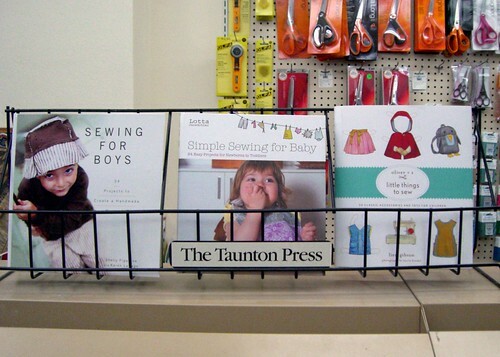 Our wool/rayon blend felt would be wonderful for any of these delightful projects and the book is available in our store. 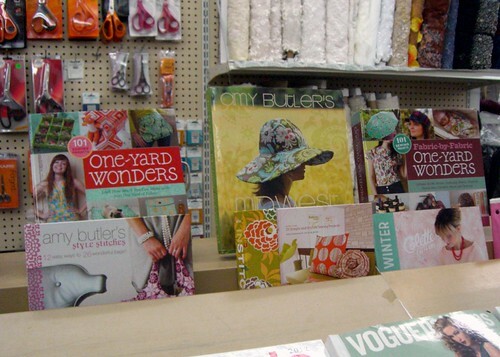 There are lots of exciting new spring fabrics coming in right now. I love the bold prints, but sometimes a lovely fabric can get overlooked among the more eye-grabbing ones. These subtle 100% linens have a metallic-effect print that shimmers slightly with movement. 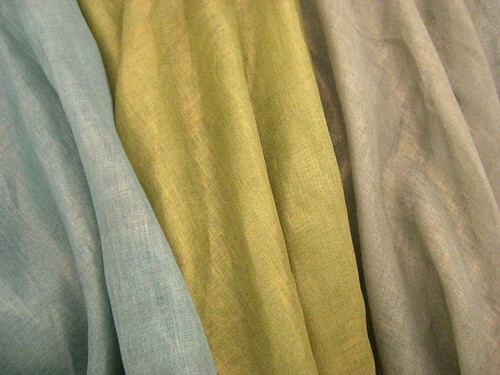 Their light weight makes them ideal for blouses or breezy, flowy dresses. A full, pleated skirt would also look great, and would be a super simple, easy to sew pattern. Treadlette Jennifer was kind enough to pose next to her latest dress, made from Lisette 1878. If you haven't seen lisette patterns yet, they are from the designer behind Oliver & S, an adorable line of children's patterns. Lisette is designed for women, but with the same fun, easy-to-wear aesthetic. The simple lines of this dress make it perfect for a large-scale print.